Baby 81 with a nurse, two maidens and two armed policemen left Kalmunai Tuesday 10 PM in an ambulance reached Colombo National Hospital early morning 6 AM on Wednesday. After a short stay at the Hospital, the baby was taken to Genetech lab in Borella at 10 AM for DNA tests, medical sources in Colombo said. 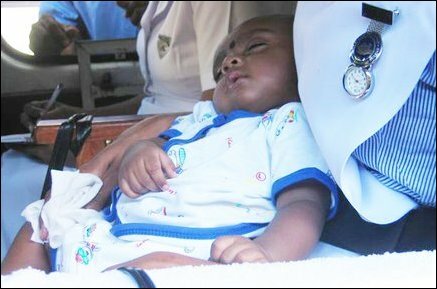 "Baby 81" on the lap of nurse Sharmila, of Kalmunai Base hospital in an ambulance. Jenita Jeyarajah claiming mother of baby 81 stepping down from the Unicef vehicle in which the couple came to Genetech laboratory in Colombo for DNA test. The Baby boy that was in sound sleep but started to cry as camera-men clamoured around him. Mr. Jeyarajah and Mrs. Jenita Jeyarajah, the only couple to appear before the court claiming to be biological parents also went separately to the lab for DNA testing. Reporters were not allowed to go inside the lab where blood was taken. The baby and the couple were inside for about an hour. The couple were allowed to hold the baby for a while, sources at the lab told the press. Mr. Jeyarajah told reporters that the baby was in good health. Mrs. Jeyarajah was not allowed to speak to media by the attending UNICEF officer. Dr. Maya Gunasekera, Chief Executive Officer and a senior scientist at the lab told that the results would be sent to Kalmunai magistrate in a confidential cover by registered post. The results are expected to reach Kalmunai Magistrate in a week.